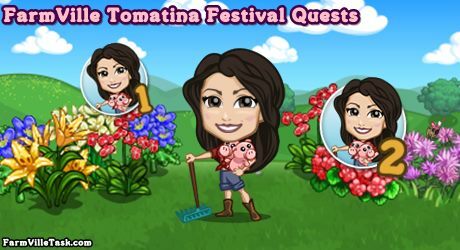 We are going to celebrate with our friend Sasha the FarmVille Tomatina Festival. She has been preparing for this event for quite some time now. That is why she is very excited with it. We are going to help her shop for the materials. On this FarmVille Quests, we are going to craft 9 recipes at the SPA, BAKERY and SPA. We already have a list of the bushels that will be used to craft them and you can find it just below of this guide. Note: Expected to be released on Thursday (August 16th). Info: Crafted at the SPA and will need Kelp Bushel x6, Green Tea Bushel x9 and Aloe Vera Bushel x12. Info: Crafted at the BAKERY and will need Carrot Bushel x9, Pepper Bushel x3 and Ghost Chili Bushel x9. Info: Crafted at the WINERY and will need Zinfandel Bushel x6, Grape Bushel x9 and White Grape Bushel x9. Info: Crafted at the SPA and will need Double Pikake Bushel x6, Daffodil Bushel x2 and Lily Bushel x4. Info: Crafted at the BAKERY and will need Taro Bushel x8, Wheat Bushel x6, Rye Bushel x4. Info: Crafted at the WINERY and will need Tomato Bushel x6, Pepper Bushel x2 and Carrot Bushel x6. Info: Crafted at the SPA and will need Lily Bushel x2, Blueberry Bushel x6, Morning Glory Bushel x6. Info: 2 days to grow and harvest. (LILAC DAFFY or SNOWED DAFFODIL will also count.). Info: Crafted at the BAKERY and will need Wheat Bushel x4, Tomato Bushel x4 and Pepper Bushel x3. Info: Crafted at the WINERY and will need Raspberry Bushel x6, Blackberry Bushel x4 and Grape Bushel x4.